Laminate flooring is an easy-to-install and easy-to-clean synthetic flooring commonly used in kitchens and bathrooms. Laminate flooring is often designed to simulate stone or wood. A common thickness used for this type of flooring is 12 millimeters (mm). Laminate flooring is a versatile material used in many bathrooms and kitchens. Laminate flooring is an easy-to-install and easy-to-clean synthetic flooring commonly used in kitchens and bathrooms. Laminate flooring is often designed to simulate stone or wood. A common thickness used for this type of flooring is 12 millimeters (mm). Laminate flooring is graded by its AC rating, with AC 1 being the lowest and AC 5 being the highest. Many companies manufacture quality 12mm laminate flooring, including Armstrong, Mohawk, Pergo and Shaw Floors. All brands of 12mm laminate can be purchased at home improvement or flooring stores. Armstrong originally began as a cork-cutting company in 1860, but by 1909, it began manufacturing Armstrong Linoleum and is one of the world's foremost producers of flooring material. 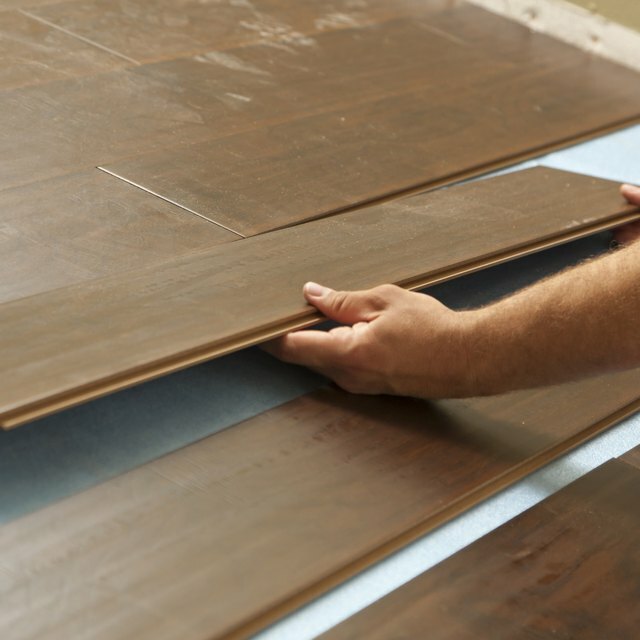 Armstrong offers 169 combinations of laminate flooring, categorized by look, do-it-yourself level, gloss, size and brand (Bruce is a subsidiary of Armstrong). Armstrong laminate comes in nine colors -- from white to black, three glosses (high, medium and low) and pieces that range in size from 6 to 12 inches). Their 12mm laminate flooring is also available in all ratings, depending on how durable the flooring needs to be. Mohawk Industries has been making floor coverings for more than 125 years. Originally a carpet manufacturer, Mohawk moved into making other flooring products through corporate acquisitions in the 1980s. Mohawk offers 36 styles of laminate flooring, differentiated by durability, color and size. Among its most popular product lines are the Barrington Collection, Festivalle, Granada and South Beach. All are available in durability ratings from AC1 to AC 5. Pergo began making laminate flooring about 30 years ago and is considered one of the most innovative manufacturers of laminate flooring. Pergo's laminate flooring is available mostly in a faux wood style (it does offer a beige faux marble) and is available in dozens of wood styles including cherry, walnut, oak, maple and hickory. Flooring is also available in multiple sizes and durability ratings. Shaw Floors started in 1946 as a company that dyed small rugs. Shaw eventually became the largest carpet manufacturer in the world and has been producing laminate flooring for nearly 10 years. Shaw offers a line of 176 laminates broken down by color, finish and shade. Shaw offers mostly faux wood laminate, but does offer several options of faux marble as part of its textured laminate collection. Shaw laminate is available in several thicknesses and durability ratings.